Here’s where I might be committing journalism-career suicide: Mary Mapes, acclaimed news producer, made some really dumb decisions that ended her broadcast news career. At least that’s what the movie adaptation of the story that got her publicly lambasted and fired from her profession appears to be telling me. As a journalism student, I’ve been told time and time again to check my sources in a news story. No matter how long it may take or how difficult the process may be, the value of concrete evidence and accurate sources have been hammered into my head so many times that a doctor would probably see “CONFIRM YOUR SOURCES” indented in my brain. I’ve also learned about time management, following up with sources, the benefit of on camera work and, probably most importantly, persistence. If there’s a problem, follow up on it and make sure it can be fixed or throw it out from the story. I put all of these basic concepts out in front because, according to the movie Truth, those concepts were chucked out the window in favor of timeliness. Too bad it cost the reporters involved their jobs. Truth is the movie adaptation of a 2004 60 Minutes reportn then-President George W. Bush, who had supposedly skipped out on his training and service in the Texas Air National Guard, which he joined to avoid being drafted to Vietnam and was given special treatment. The story was produced by Mary Mapes (Cate Blanchett) and her personal team of reporters (Dennis Quaid, Elisabeth Moss and Topher Grace). Despite the legitimacy of documents used in question, sources unwilling to talk or go public and a mere five days to put it all together, Mapes and her team finish the story in time for Dan Rather (Robert Redford) to deliver it to the world. Mere days after the story is broadcasted, online blogs and fellow news media outlets start questioning the story, citing how a group of memos used as a primary source have font patterns and indentations been that could’ve only been typed up on a computer. Rather, Mapes and her team face attacks from the media as they try to keep the story relevant. Like most movies about journalism, Truth tries to paint Mapes and her team as fearless heroes fighting back against the evils of conservative media and legal teams. However, the movie takes more broad shots than it does at specific targets. Despite some conservative blogs pointing out errors in the story, Truth damns all of the Internet as a hive of uneducated bullies. While other news media outlets are simply regurgitating that the story is under investigation, the movie tells its characters that everyone is out to get them. It’s like the cool kids table in a high school cafeteria: you’re either with them 100% or you’re a loser who can’t sit with them. While I know nothing about how the actual story and its aftermath took place, Truth paints its real-life characters in a very unprofessional light. While the purpose of the story appeared to be something juicy to air before the 2004 election, the dialogue between the reporters when they’re gathering their resources feels like they want to the story to keep Bush from being re-elected. To the movie’s credit, it shows how stressful it is to get sources on the record about something that could taint the President’s reputation (especially in the five day span the team was given to get the story together). However, when everything hits the fan and the team scrambles to keep their story solid, Truth doesn’t present them as noble reporters following procedure but as frantic, jaded big shots that would rather point the finger of blame elsewhere than admit their own faults. It’s understandable that the reporters want to do everything possible to make the report as legitimate as possible, but Truth plays it out like a smear campaign against Bush. I’m no Bush supporter, but shouldn’t the accuracy of a report matter more than how timely it is? If the movie can’t stand on its vision of the reporters, the actors in it can. 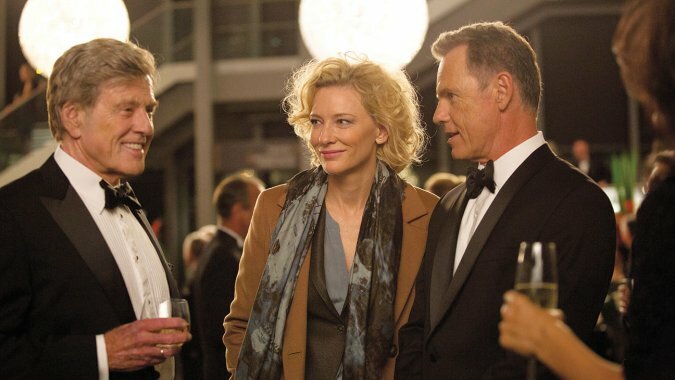 Cate Blanchett dives headfirst into the role of Mapes and nearly walks off with the movie. There’s a tenacity that only she brings to roles, and Mapes is no exception. She deals with the whirlwind of emotion Mapes goes through during the movie, stern and brave against critics while emotionally breaking down as she realizes she failed her friend. That’s Dan Rather, played by Redford who is on autopilot but makes it look better than most actors. The reporting team all has fine actors, except for Topher Grace who still comes off as the whiny punk from That 70s Show. I’m not sure if he’s trying to give a different performance and it doesn’t connect or he just doesn’t have anything beyond the “Eric Forman” character, but it’s very hard to take him seriously. Truth has good intentions for sure, but it’s hard to cheer on the characters the movie depicts when it’s easy to see how their methods will be their downfall. It’s like watching the rest of the Spartans in 300 have their final confrontation with Xerxes. They’re all valiant, but you know they’re all getting slaughtered with the wave of Xerxes hand. What’s worse, Truth doesn’t acknowledge that Mapes and her team screwed up until the last ten minutes of the movie. Even after that happens, Mapes and Rather get a slow-motion final scene for each other that tries to send them off gracefully. In the context of their careers, of course they deserve it, but Truth doesn’t do anything to build a case of sympathy. I’m not taking anything away from the real life Mary Mapes and Dan Rather, who have both done incredible jobs reporting the news in the past. In fact, they should sue the makers of Truth for making them look like little kids who’d rather throw a tantrum than say they’re sorry for what they did. It is important to keep the hard-hitting questions Truth brings up in circulation, but the problems with its explanation and evidence can’t be shoved under the rug. This entry was posted in Movie Review and tagged 60 Minutes, CBS, Dan Rather, George W. Bush, journalism, movie review, Truth. Bookmark the permalink.